It’s the key to our new house! It’s not the key to my heart in case that was your first guess. Dave has that tucked away safely somewhere. Awww! That was so tender!! Congrats! How cool is that? Where is the house? I know I’m a b-h, but I need some more details about this house. yay! congrats! where are you guys moving to!?! Congratulations! Fun for you to start decorating your new house! yeah for frockly. yeah for the new house. can’t wait to see pictures. 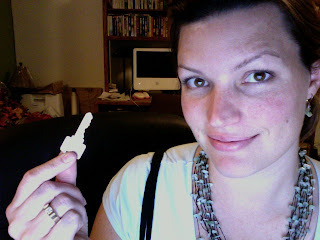 you are one cutie with that key! I’m SO excited for you guys and SO incredibly jealous. Congrats and good luck with the transition. Hey there, you are so grown up! Jeff had a lot of fun with Dave at the game too! We’re going to the game today so we’ll look for him! Ps I want to see your house! You need to come see ours too! But, can’t really complain since you will still be really close by. we are just going to be in the neighborhood next to days market. there will be lots of details coming as we work on this little baby. lots of before and after pictures. we are a bit scared as we don’t know what we are doing, but really excited too. ok – so now ive connected to your blog! if you r moving then at least i can keep track of you. Wow – I’m so happy for you! Don’t know if that will ever happen for us…… but yay for you – can’t wait to see pictures! !